The Cuisinart CTG-00-MAN is the perfect tool for preparing many culinary delights. It features ultra-sharp stainless steel blades, made with the same precision technology used to forge cuisinart's food processor blades. This also has five cutting options with a uniquely designed food holder and interchangeable blades. The cuisinart mandoline has soft-grip handle for comfortable hold and includes cut resistant safety glove. The Mandoline 5 Cutting Options has many exciting features for users of all types. 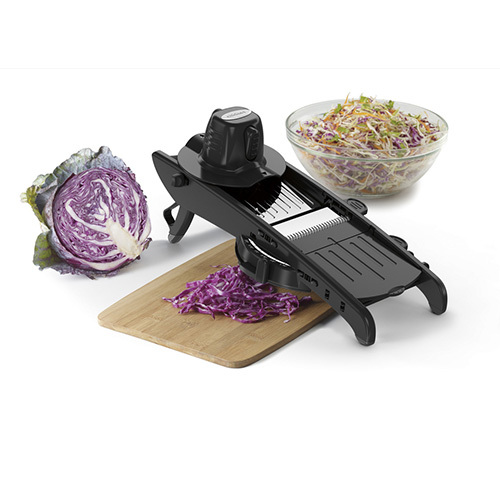 See the Mandoline 5 Cutting Options gallery images above for more product views. The Mandoline 5 Cutting Options is sold as a Brand New Unopened Item.